Thinking of Building Your Own Intranet? Understand what you are getting yourself into! With the availability of SharePoint Modern UI and Communications Sites, many organizations are thinking about building their own Intranet to save money. While this may seem like a great way to go, but there are things you need to know. Like anything else, in the end it is a business decision. We have seen many people try to build their own, only to come back to us after they realize it is not as easy to do as Microsoft portrays. Take a look at the information below, and view the video. Hopefully it will enlighten you to what is involved. ​As with any business application or system, you have to make a business decision on the approach you wish to take in deploying an Intranet. While you may think that you have unique requirements, odds are that may not be totally accurate. Like your accounting system, there are best practices learned over many years of experience that can be applied to an intranet deployment. Does it make business sense to build an accounting system today? Probably not. The same may apply to your Intranet. While your portal structure tied to your organization structure may be different, best practices around document organization, news roll-up procedures and other key functions are the same. We have seen over and over again technical or marketing staff in organizations try and build their intranet internally, only to have them approach us after several months of a failed project because it was bigger than they thought. 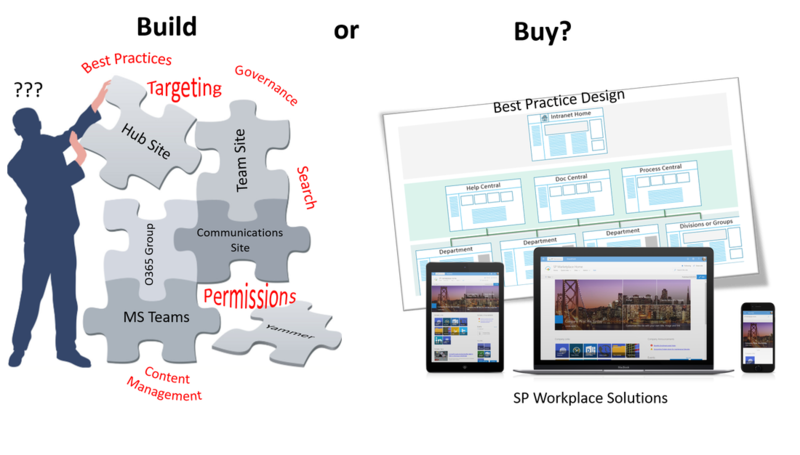 Have you ever designed and built an Intranet before? Do you have an understanding of the best practices to apply? Can you design the required security and governance plan? Do you understand both SharePoint and Office 365 services sufficiently to develop it? Are you ready to support your Intranet going forward when SharePoint Online changes (it does every month)? If outsourcing will the consulting firm support it going forward? Can you design it so that administration and content management can be done by power users in Departments and Groups. If all the answers are yes, then you are well equipped to build your own. If not, consider accelerating your deployment, lower the risk and cost with our out-of-box best practice solutions that are no-code and 100% customizable by a power business user. Basic Department Site: Create with Team Site. Content Management: No targeting, no display control, must add meta data, build new content lists. Content Roll-up from sub-sites: All News, no selection, no approvals. See Content Governance, Management. Future Microsoft Changes to SharePoint Online: You fix it. Time/Cost: Estimated 150-200 hours + training. At least $20,000, plus ongoing support. Buy it - Pre-built on top of those SharePoint sites. Basic Home Site: Done, built on a Communications or Team Site with added features and enhancements. Content Management: Done. Content Management Dashboard to control audience targeting, display, and approvals. Content Roll-up from sub-sites: Selective content, with top site approvals.